The 2019 Hardwood Federation's Board of Directors and Hardwood Federation PAC Board of Directors held their annual winter meetings in Washington D.C. on February 11-12. As always, it was a packed few days of discussion, networking and strategic planning for the Federation and our board. Board Leadership is Named: The first order of business was the welcome and introduction the members of our 2019 Board of Directors and HFPAC Board of Directors. Rick Holden, COO of Derr Flooring was elected as Board President for 2019-2020. He will be ably supported by incoming Vice President Matthew Smith, Managing Director of Smith Creek. The HFPAC Board will continue with Board President Tommy Maxwell, President and CEO of Maxwell Flooring. Bob Miller, Director of Marketing for Frank Miller Lumber has assumed the role of HFPAC Vice President. You may view the full list of HF and HF PAC Board Directors online at HFBoard and HFPAC Board. HF would like to thank all of our board members for their interest, engagement and dedication to furthering the industry's interests on Capitol Hill. We look forward to working with you all! HF Policy Agenda Is Set: The primary focus of the February meeting is to set the direction and priorities of the Federation for the coming year. Taking into consideration our 2018 advocacy activity, the anticipated Administration agenda, and the responses to the annual Hardwood Federation Priority Policy Survey, the Boards discussed and set a policy priority agenda for 2019. National and world events can shift some of this course, but to have a sense of direction at the start of every year helps the Federation staff focus limited resources in the best way passible. Survey results show that the top issues for the industry are Regulatory Reform, Federal Forest Management, Tax Reform, Trade, and Innovative Wood Products. Funding Government Programs that Enhance Exports, Export Markets, the Lacey Act, Biomass, Immigration Reform, and the Endangered Species Act were also identified as important issues to follow. The Board added a focus on Transportation issues - with special regard to trucking - and other Infrastructure issues that may have potential to move in a now divided Congress. Hardwood Economic Impact Study Released: The Hardwood Federation Board of Directors were also informed of that the long awaited Hardwood Economic Impact study is ready for release and distribution. The findings show that the U.S. hardwood forest products industry helps to employ over 1.8 million people and contributes $348 billion to the U.S. economy. Hardwood producers and manufacturers, including sawmills, lumberyards, flooring companies, kitchen cabinet manufacturers and railway ties, directly support more than 685,000 jobs in 25,000 facilities generating $35 billion in annual income. Related industries, including transportation, retail, forest ownership and logging support more than 1.1 million jobs and add $212 billion to the economy. For every $1 million in output of hardwood products, 5.3 jobs are created. The Hardwood Federation was established as a coordinating body within the industry to represent common interests on federal policy Washington D.C...a mandate we are proud to continue. The economic impact study project is a natural extension of our daily activities on the Hill: identifying unifying goals, gathering supportive industry and association leaders, jointly developing solutions and serving as an organizing body for implementing those solutions. The result is a product that has far reaching value beyond one company or one organization. We look forward to continuing to work with all the wonderful members of the hardwood community to identify future ways to serve the industry in this manner. The hardwood industry economic impact study was conducted by Agribusiness Consulting and financially supported by the following organizations: The American Hardwood Export Council, the Appalachian Hardwood Manufacturers Inc., the Decorative Hardwoods Association, the Hardwood Federation, the Hardwood Manufacturers Association, the Indiana Hardwood Lumberman's Association, the Kitchen Cabinet Manufacturers Association, the Lake States Lumber Association, the Maple Flooring Manufacturers Association, the National Hardwood Lumber Association, the National Wood Flooring Association, the Railway Tie Association and the Wood Component Manufacturers Association. Additional support was provided by the Hardwood Market Report and the Pennsylvania Lumbermen's Mutual Insurance Company. It may be viewed at www.hardwoodfederation.com . On Sunday February 24th President Trump capped six days of intensive trade negotiations in Washington between U.S. and Chinese negotiators with a pair of tweets that claimed "substantial progress" in trade talks and announced a delay in the tariff increase (raising tariffs on List 3 products ($200 billion in Chinese imports) from 10 to 25 percent slated for March 2) for an unspecified period. On Twitter, President Trump announced progress on a range of areas, including "important structural issues including intellectual property protection, technology transfer, agriculture, services, currency, and many other issues." The White House has not yet released a formal statement but sources indicate that the two sides continued detailed discussions on formal outcome language in six broad areas, including both structural policy change and enforcement mechanisms for the five areas listed in the President's tweet plus the broad category of non-tariff barriers. President Trump's statement did not include an announcement of any specific time period for the tariff delay but did state that the two sides could have "some very big news over the next week or two." Negotiators for both sides are said to be planning for a summit between Presidents Trump and Xi at Mar-a-Lago in the near future. Previous statements from senior White House officials indicated potential March timing for such a summit, and President Trump's follow-up remarks at the White House Governors' Ball on Sunday night lent further credence to a quick turnaround, as he stated that the two sides could have "some very big news over the next week or two." In an appearance before the House Ways and Means Committee on Wednesday, February 27, U.S. Trade Representative Lighthizer who is leading negotiations with China, was somewhat less optimistic. USTR Lighthizer stated that the Administration is "pressing for significant structural changes that would allow for a more level playing field -- especially when it comes to issues of intellectual property rights and technology transfers," and noted that it is still too early to tell if or how much China will concede to U.S. demands and what an enforcement mechanism would look like. He emphasized a focus on striking an agreement that would target structural issues, would be fully enforceable and would preserve the United States' ability to respond to any further trade violations unilaterally - without going through a dispute settlement process at the World Trade Organization. In early February, a bipartisan group of Senators reintroduced legislation to extend the Secure Rural Schools program. The bill, S. 430, was introduced by Sen. Mike Crapo (R-ID) and cosponsored by Senators Ron Wyden (D-OR), Jim Risch (R-ID), Joe Manchin (D-WV), Lisa Murkowski (R-AK) and Jeff Merkley (D-OR). Secure Rural Schools (SRS) is a nearly 20 year old program that was established to assist counties with large tracts of federally-owned land that is tax-exempt. Many rural communities in those states rely on the program to help pay for schools, roads and other critical services. Specifically, critical services at the county level have historically been funded in part with a 25 percent share of timber receipts from federal Forest Service lands, and a 50 percent share of timber receipts from federal Oregon and California Grant Lands managed by the Bureau of Land Management. As those revenues have fallen due to reduced timber harvest, SRS payments have helped bridge the gap to fund rural schools, road maintenance, search and rescue efforts and other services. The Hardwood Federation has supported similar proposals in previous Congresses, recognizing the lifeline this program extends to many rural communities near national forests. Additional reforms to how our federal forests are managed may surface in an interesting new context-as part of a national transportation infrastructure spending package. An effort has been initiated by centrist environmental groups like the Nature Conservancy, asserting that the national forests are "infrastructure" and need funding for maintenance and management just as much as highways, bridges and ports do. The Forest Service maintains about 300,000 miles of roads that are currently open. According to Jim Hubbard, the Department of Agriculture's Undersecretary for Natural Resources and Environment, the Service currently faces an infrastructure backlog of $5.2 billion, mostly in roads. As we know, these roads are often used by firefighting crews and can be utilized for forest thinning operations. The new Chairman of the House Transportation & Infrastructure Committee Peter DeFazio (D-OR) has been messaging continuously since he became Chairman about his desire to advance an infrastructure package in the House. We remain somewhat skeptical that a comprehensive transportation infrastructure package can become law this year given that a highway bill is up for reauthorization next year, but we are encouraged that our allies in the environmental community are looking creatively and opportunistically at advancing a federal forest management policy agenda. We are now reaching out to TNC and others to coordinate advocacy efforts in this space. One of the many provisions that was folded into the FY 2019 government funding bill that was finally signed in February after a prolonged partial federal government shutdown is language on biomass carbon neutrality. Specifically, the provision directs the Departments of Agriculture and Energy, as well as the Environmental Protection Agency to recognize the carbon neutrality of forest based biomass fuels and energy in any environmental or energy policy. This directive was first enacted back in 2017, however we have had to continually advocate for its extension since it was enacted as part of a government funding measure. Although the language in the FY 2019 bill does not secure permanency for the provision, it does authorize this directive through the end of the current fiscal year. The Hardwood Federation will continue to work with our allies in trying to make this carbon neutrality directive permanent. Appropriations language was in play last year which clarified that the directive would be in effect for FY 2019 and every fiscal year thereafter. Unfortunately, despite bipartisan support for the provision, we were not able to advance this language over the goal line. It is worth noting that there is strong opposition to this provision from certain environmental groups who believe that biomass is not renewable and that a carbon neutral designation only serves to promote deforestation. Nevertheless, we are renewing our efforts in the appropriations cycle for 2020 and will take another run at securing language that perpetually extends this beneficial policy. On Tuesday Feb. 27th the House passed S. 47 the "Natural Resources Management Act" by a vote of 363-62. The legislation, co-sponsored by 50 Senators, had already cleared the Senate earlier this month on a 92-8 vote and, among other things, permanently extends the Land and Water Conservation Fund (LWCF). Created by Congress in 1964, the LWCF was a bipartisan commitment to safeguard natural areas, water resources and provide recreation opportunities across the country. National parks like Rocky Mountain, the Grand Canyon, and the Great Smoky Mountains, as well as national wildlife refuges, national forests, rivers and lakes, community parks, trails, and ball fields in every state have received money from the Land and Water Conservation Fund. Every year, $900 million in royalties paid by energy companies drilling for oil and gas on the Outer Continental Shelf (OCS) are put into this fund. However, a considerable portion of these deposits have been diverted over the years to non-conservation purposes. The provisions in S. 47 are aimed at rectifying this issue. Overall, the legislation is a conglomeration of over 100 separate bills sponsored by 50 senators. In addition to the LWCF provision, the bill would add 1.3 million acres of new wilderness, 620 miles of new wild and scenic rivers, and 2,600 miles of new national trails. Legislation known as the DRIVE (Developing Responsible Individuals for a Vibrant Economy) Safe Act is expected to be reintroduced this week. The bill would set up an apprenticeship program to train younger truck drivers (those drivers in the 18 to 21 year old range) to traverse state lines on the interstate. Currently, drivers under the age of 21 cannot legally drive a commercial motor vehicle across state lines. These drivers are able to receive their commercial drivers license (CDL) but must stay within state lines, operating intrastate, making it difficult for interstate carriers to enter into long-term, valuable relationships with them. As an example of the need for reform, a young truck driver may currently travel the length of the State of Maine (over 300 miles), but is not permitted to cross the border into New Hampshire, even if it is only a short trip. The apprenticeship program outlined in the DRIVE Safe Act includes 400 hours, of which 240 hours must be drive time with an experienced driver. Young drivers would also be equipped with automatic transmissions and safety equipment such as automatic braking. The truck driver shortage in the U.S. is a real concern across the economy. Currently, the average age of a trucker in the U.S. is 54 years old, a data point that dramatically underscores the need for an infusion of younger drivers entering and remaining in the profession. In fact, only 20 percent of drivers on the road today are between 20 and 34 years old. Estimates suggest that almost 1 million new drivers will be needed over the next decade to keep up with truck transport demand. While certainly not a panacea, the DRIVE Act is a sensible first step in attempting to address the issue. There are a number of groups lobbying aggressively for enactment of this legislation, including the National Association of Manufacturers, the American Trucking Association, the National Retail Federation and companies like Sysco and FedEx. Your Hardwood Federation team will be engaging in support of this bill in response to our issue survey and input from members indicating that trucking issues are of increasing concern to the sector. Ongoing efforts to repeal the Estate Tax have resulted in H.R. 218 the "Death Tax Repeal Act" introduced by Rep. Jason Smith (R-MO) and Rep. Sanford Bishop (D-GA) with 38 original cosponsors in the House and S. 215 the "Death Tax Repeal Act" introduced by Sen. John Thune 9R-SD) with 28 original cosponsors in the Senate. These bills are the same as language introduced in the last Congress and, while noting that full repeal is unlikely to happen, set good groundwork for the expected challenge to the Tax Cuts and Jobs Act of 2017 exemption that reduced estate tax burden from previous levels. HF has signed on to multiple letters in support of both bills and will continue to monitor this and other relevant tax issues closely. You may check out one of the letters here. 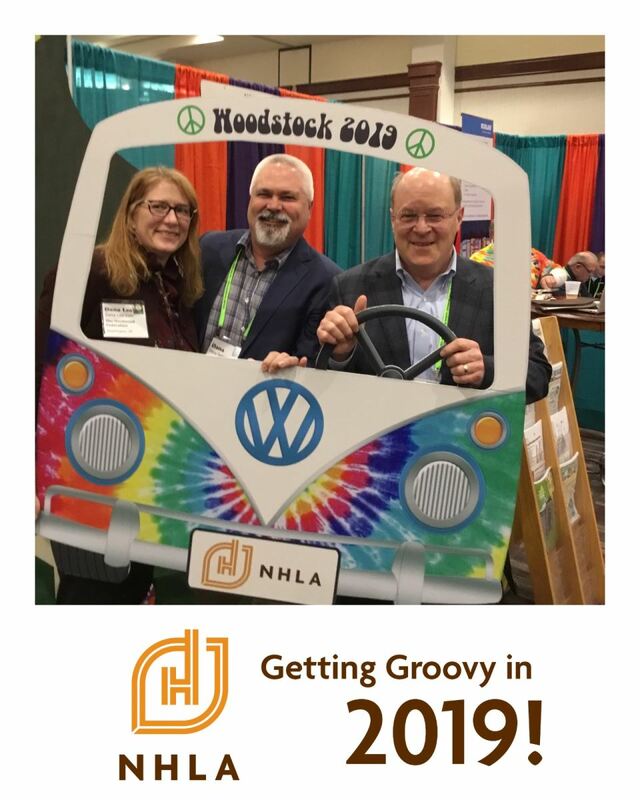 HF's Dana Lee Cole, NHLA Chief Inspector & Dean Dana Spessert, and Busdriver Ted Rossi of The Rossi Group "Getting Groovy" at the NHLA Booth during the IHLA Convention in Indianapolis. February. Valentines Day. Love. Trees.(???) Your significant other has probably polished off the chocolates by now and the petals of those roses are starting to fall, but the love fest doesn't have to end even though Valentines Day is over. Equipment manufacturer Husqvarna has created a new "dating" app to match Tree Lovers with Trees. Timber (like Tinder), lets those fond of trees, not just the tree huggers, scroll through profiles of different tree species to reject or accept those the feel closest to. The profiles include the tree's age, location, biography (usually very tongue in cheek).